A popular antibiotic called rifampicin, used to treat tuberculosis, leprosy, and Legionnaire's disease, is becoming less effective as the bacteria that cause the diseases develop more resistance. One of the mechanisms leading to rifampicin's resistance is the action of the enzyme Rifampicin monooxygenase. Pablo Sobrado, a professor of biochemistry in the College of Agriculture and Life Sciences, and his team used a special technique called X-ray crystallography to describe the structure of this enzyme. They also reported the biochemical studies that allow them to determine the mechanisms by which the enzyme deactivates this important antibiotic. The results were published in the Journal of Biological Chemistry and PLOS One, respectively. "In collaboration with Professor Jack Tanner at the University of Missouri and his postdoc, Dr. Li-Kai Liu, we have solved the structure of the enzyme bound to the antibiotic," said Sobrado, who is affiliated with the Fralin Life Science Institute and the Virginia Tech Center for Drug Discovery. 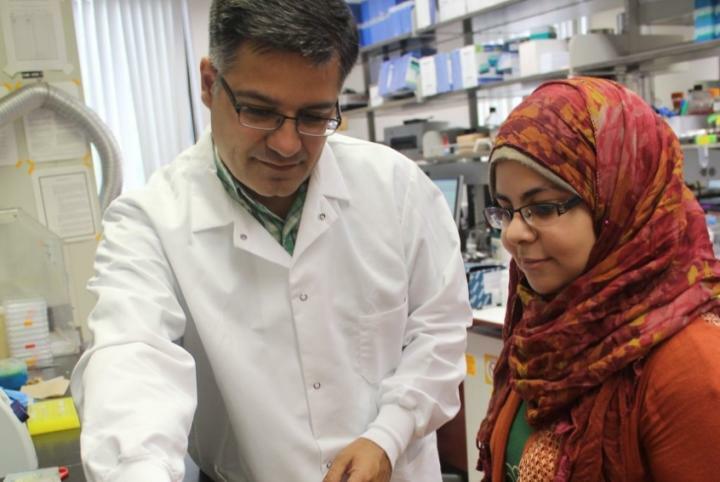 "The work by Heba, a visiting graduate student from Egypt, has provided detailed information about the mechanism of action and about the family of enzymes that this enzyme belongs to. This is all-important for drug design." Heba Adbelwahab, of Damietta, Egypt, a graduate student in Sobrado's lab, was a key player in the research and first author of the PLOS One paper. "Antibiotic resistance is one of the major problems in modern medicine," said Adbelwahab. "Our studies have shown how this enzyme deactivates rifampicin. We now have a blueprint to inhibit this enzyme and prevent antibiotic resistance." Rifampicin, also known as Rifampin, has been used to treat bacterial infections for more than 40 years. It works by preventing the bacteria from making RNA, a step necessary for growth. The enzyme, Rifampicin monooxygenase, is a flavoenzyme — a family of enzymes that catalyze chemical reactions that are essential for microbial survival. These latest findings represent the first detailed biochemical characterization of a flavoenzyme involved in antibiotic resistance, according to the authors. Tuberculosis, leprosy, and Legionnaire's disease are infections caused by different species of bacteria. While treatable, the diseases pose a threat to children, the elderly, people in developing countries without access to adequate health care, and people with compromised immune systems. See the Virginia Tech news release here.